Can anyone return these useful < and > buttons please and keep correct order of Tabs? 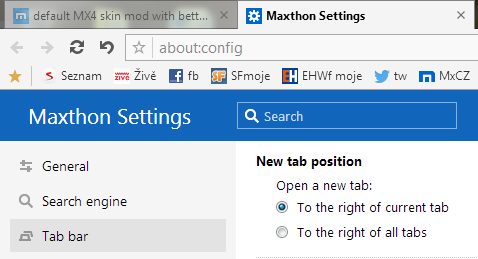 MX4 is nightmare to use when you have many tabs opened, you have to open dropdown list and select tabs that out of screen, and instead of centering this tab and showing left and right tabs, MX4 shows this tab instead of last of right tabs that was show. MX3 default skins was much more comfortable to use with left and right tab buttons and scroll of tabs right in tab bar, its shame that MX4 devs and designers does not recognise and fix new design flaws after so many years since MX4 appeared. Another issue i bet many has with MX4 design usability - lack of option to show ONLY ICONS (and short text like 5-10 letters in case if no icon is downloaded, the way IE does) in compact view of favorites bar. There is another think i would like to see, but not sue if skins allow that - in IE there is a very useful feature - you can add RSS subscibed channel to fav bar, and it will show dropdown menu with headlines. Since im moved to MX from IE im really missing this feature. Can anyone please mod original MX4 skin of latest beta version to fix these issues? Use/ write in English here - even by translator like Google etc. ! Or here it is Spanish Forum / Foro Oficial en Español http://forum.maxthon.com/forum-86-1.html?utm_source=support&utm_medium=link&utm_campaign=topproductsupport3.